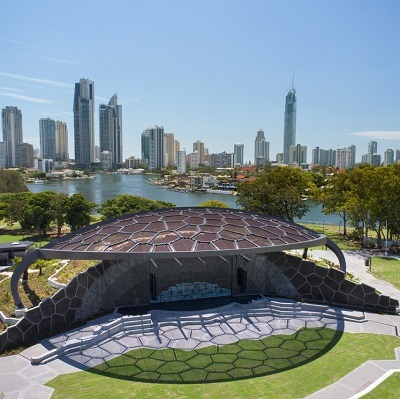 After a bumper start to the year, the Gold Coast’s arts and culture hub – HOTA – is gearing up for a stellar line-up of shows and performances scheduled over the next few months. As HOTA’s preferred PR agency, M10 works closely with the team to deliver on planned publicity campaigns to build awareness and ultimately draw patrons to the diverse range of offerings that continue to light up HOTA’s stage. On May 9, the Melbourne International Comedy Festival Roadshow travels to HOTA with a side-splitting line-up of comedic talent. Australia’s own funny man, Daniel Connell, has been announced as this year’s MC; home-grown talent, Josh Earl, who is one not to miss; seasoned Canadian comedian, John Hastings, who has appeared at every major comedy festival in the world; Indian comedy superstar, Rahul Subramanian, returns to Australia with his anecdotal and observational acts; and Danielle Walker, who is known for her unique (and slightly dark) everyday observations. Jazzing up HOTA’s stage on May 11, is none other than Vince Jones and The Astral Orchestra, who play tribute to two of Van Morrison’s most acclaimed albums and masterpieces – Astral Weeks and Moondance. The classic albums of a golden era had an enormous impact on Jones, the remarkable interpreter and composer of contemporary jazz style music. The result led him to invite a selection of Australia’s finest jazz/rock musicians to form The Astral Orchestra, led by Music Director Matt McMahon, to play tribute to Morrison’s renowned works. May 18 is a date not to miss, with the Indigenous dance sensations and landmark dance/theatre company, Djuki Mala, lighting up HOTA’s stage. Their spectacular fusion of traditional dance, pop-culture and storytelling aims to electrify audiences at major festivals and events all around the world. Their show tells the genesis of Djuki Mala, offering a rare and insightful view into Indigenous Australia. Their comedic, yet soulful performances, have attracted massive media interest worldwide, winning multiple awards and nominations, and selling out crowds at Season Sydney Opera House and Edinburgh Fringe Festival in 2017. National Geographic – Symphony for Our World features on May 25, with a spectacular combination of stunning National Geographic natural history footage to the backing of some of a live orchestra and choir setting the mood. This breathtaking musical journey takes viewers through some of the world’s most incredible wildlife spectacles and draws viewers from far and wide to experience this magical performance. For more information, visit https://hota.com.au/.